This poster recognizes the overarching need for multiculturalism in the field of computer science and related fields. 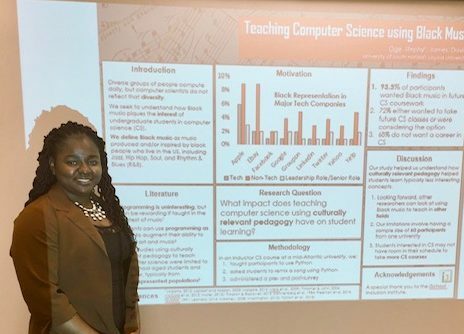 After identifying key themes in the literature, we seek to explore the links between culturally relevant pedagogy and computer science, using Black music with college students. Data will be collected from pre- and post-surveys given to students in an introductory computer science course. Participants will be freshmen and sophomores not in computer science majors at a small mid-Atlantic liberal arts university. The practical implications of this quantitative study are to examine the best practices of teaching computer science to college students to increase ethnic inclusiveness in the field of computer science.